A frost that could chill your beer has finally lifted from the HFF household this evening. It settled coolly around everyone’s vitals on Wednesday at lunchtime, when I lost my rag with the hairy hubby over tense horticultural issues. 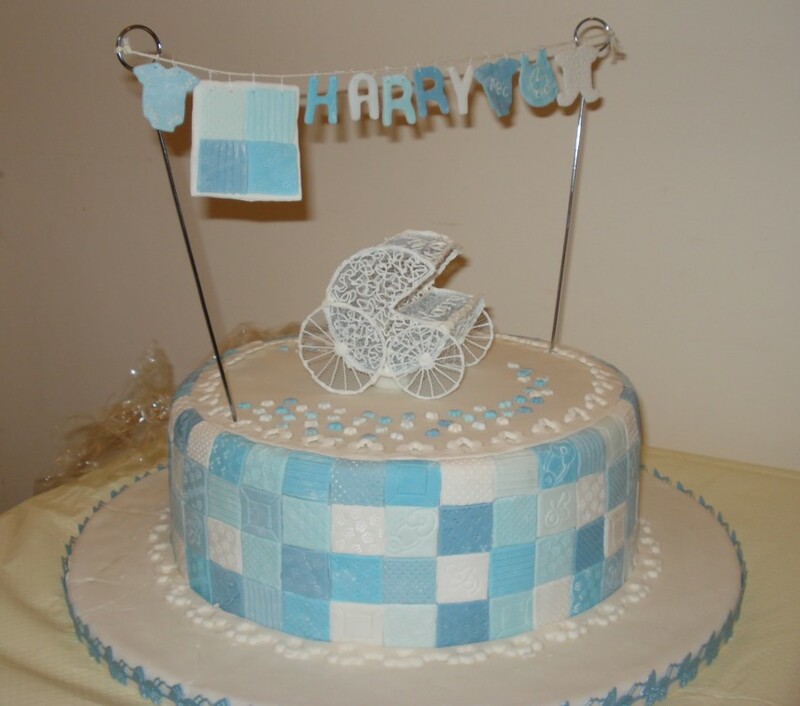 Context: I have been planning Harry’s first birthday party since… Oooo, since the final attendee of his Christening party departed the house, say. Balloons and fairy cakes excite me greatly, you see. I have some over-compensation issues as well: Harry’s early arrival resulted in a distinct absence of glorious baby-festival. The champagne never made it out of the wine rack, the cards and beautiful gifts piled up, unopened (sight of the gorgeous wrapping and be-ribboning of the boxes alone would normally have sent me ecstatically into stratospheric orbit whilst clucking madly), and the bouquets shrivelled unnoticed on the kitchen floor. We celebrated a little when H came home, but it just didn’t feel like the new-arrival-baby-bliss I’d dreamed of for so many years. The window for wild and joyous revelry in the birth of our child seemed to have gone past. The balloons had gone all saggy. 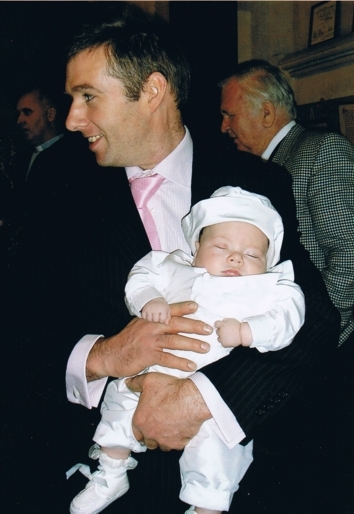 So Harry’s Christening party was a swell affair – with balloons! and fairy cakes! – but I had 65 adults and 11 children in the house, and did all the catering myself. With a volcanically refluxing 16-but-should-be-9 weeker. AND made a big ol’ cake. Unsurprisingly, we so were desperately behindhand that I ultimately had to delegate the balloon-festooning I had been looking forward to, and after the service I was so busy cutting cheeses, pies, rolls and cold joints, whilst simultaneously organising my aunts into teams of carvers, servers and waitresses, that the whole event passed me by rather. So, I have been looking forward to Harry’s birthday like a rabid dog who sees a cool bowl of water and a juicy leg up ahead. Delighted with his summer arrival, I had planned an outdoor party. (I am mid-February, which is a crappy time for parties. The day after Valentines day, as it happens. Hubby has threatened to find scope for economy there before now.) This involved the transformation of the only flat section of ground (solid clay, stuffed with broken glass from where we stupidly demolished the last house without removing the windows first) that we possess by the house into a nice lawn for babies to play on. This would necessitate John building a flight of steps, moving the hen fence (which he has put up in the wrong place, according to me, and the only right place, according to him), and shifting the topsoil from the large heap in the orchard over to where I wanted to lay the turf. The soil would need to settle and be raked before laying the turf. The turf would need to be watered, cut and cared for, before unleashing 15 small people and their proud mamas on top of it. You do not need a qualification in landscaping or indeed in husband-management, to know that this is a tall order. I had been on at John since the start of spring to get something done, and he had been the epitome of masterly inactivity. 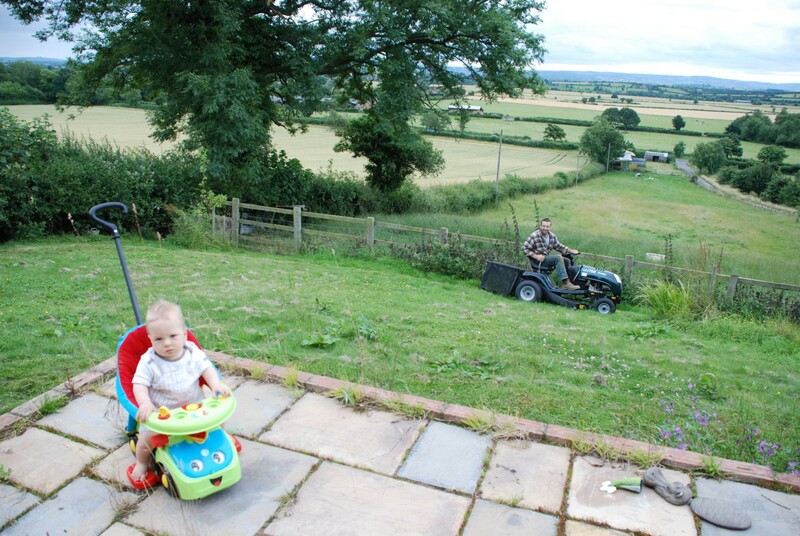 He claimed to be busy with work, and his JCB signally failed to trundle up the drive. 6 weeks ago, my plaintive appeals turned into outright nagging, and a month ago I started to become mildly abusive on the subject. My explosion of disappointment and rage occurred when an exasperated enquiry resulted in an admission that it was now too late to achieve anything prior to the date. I consequently took the only adult, civilised option available to me, and froze the bugger out for 2 days. The cold shoulder was turned. The icy back was presented. Syllables were confined strictly to the subject of the child, and rationed heavily at that. Meals were not provided. Today, however, a good friend of ours came round for coffee and passed on some meaty gossip that I kept to myself for over 5 whole hours before yielding to the need to share it with him. I did not cave without dignity. I made sure I prefaced my juicy guess-what-A-said about-B olive branch with a unexpurgated explanation of my wild irritation, with due pause, emphasis, and repetition of any points that I felt he may have missed the full significance of. And because he is really a good hubby who always does mean well, I at no point belted him slightly with a spade. He also had sufficient self-preservation instinct to actually admit to being a bit crap, although I am wifely-wise enough to realise that his fingers were probably crossed behind his back when he said it. His sorriness for my disappointment appeared sincere after I cried, though, and I know he will consequently try his hardest this week and next to render the sloping area of spiky-grass-with-half-bricks-stuck-out-of-it by the kitchen habitable for toddlers. I know this also because I will be making damn sure that I’m stood over the dear man. And I would willingly share with you what A said about B, by the way, but I fear it is too convoluted and contextual to amuse you. 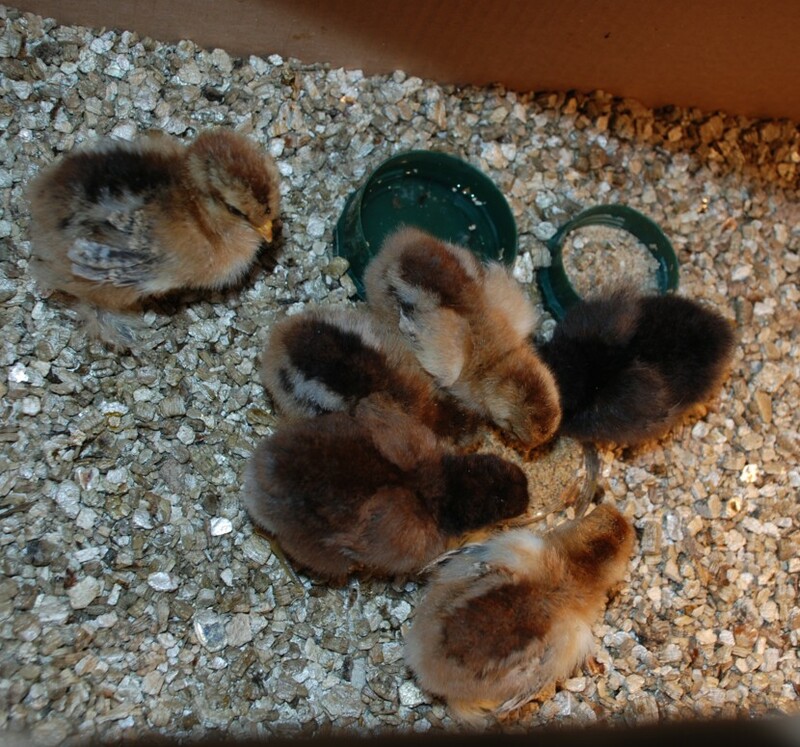 Instead, I shall leave you with a photo of the week-old chicks, who are already losing their cute fluffiness to feathers. Around here, Tempus don’t half Fugit lately.